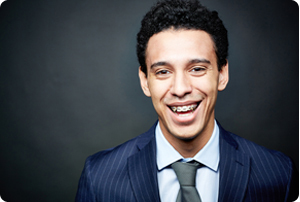 Orthodontic treatment is not just for children and teens. Dr. Shafer is Champaign and Mahomet, IL’s favorite orthodontist for adult braces. We believe that no one is too old for braces and orthodontic treatment. In fact, adults seek braces and orthodontic treatment for many of the same reasons as children and teens. Call 217.356.9595 today for your complimentary, no-obligation consultation for adult braces at our conveniently located orthodontic offices in Champaign and Mahomet, Illinois (IL)! Great waiting area for parents! I just started with Dr. Shafer, but when I walked into the office there was a whiteboard that said, " Welcome to our office Julia!" I was SO nervous, and seeing that sign made me feel better. They're so nice that it makes me want to get braces! *The reviews listed are from actual patients of Dr. Robert Shafer. Individual results may vary. Reviews are not claimed to represent results for everyone. Dr. Robert Shafer, Champaign and Mahomet, IL's favorite orthodontist offers the most advanced braces for children, teens and adults, including metal braces, clear ceramic braces, Invisalign and Damon braces. Fisher, IL, Monticello, IL and Farmer City, IL. For your or your child's free consultation for braces at our conveniently located orthodontic offices in Champaign and Mahomet, Illinois (IL), call today!